Meet Donna Urbikas, author of My Sister’s Mother: A Memoir of War, Exile, and Stalin’s Siberia. 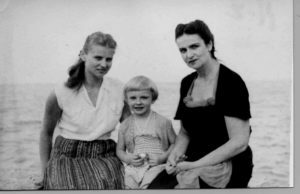 Urbikas’ book is the true story of her mother Janina’s and sister Mira’s eviction from their small, family farm in eastern Poland by the Russians during World War II. Far less has been written about the devastating acts committed against Poles during World War II by the Russians under Józef Stalin. I read the book shortly after it came out in 2016, and consider it an important addition to my growing library on Polish history and memoirs. Two weeks after Germany invaded Poland on September 1, 1939, Russia invaded Poland on September 17, 1939, and the two invaders divided Poland in half. Early on the morning of February 10, 1940, Soviet secret police appeared on Janina’s doorstep, and forced Janina and Mira, who was only five at the time, on a weeks-long journey across the frozen Siberian wilderness to a forced labor camp. Janina’s husband had already been arrested and sent to prison, so she was truly on her own. Like hundreds of thousands of other Poles forced into deportation by the Russians, they were forced to travel in crowded cattle cars in very primitive conditions. This book is exceptionally well-written and held my attention throughout. Somehow I was expecting a tale of history, more academic in nature, since it is published by a university press. The book certainly includes a lot of history that is supported by research, but the core of the book focuses on motherhood, the roots of relationships between a mother and daughter, and how far a woman is willing to go to survive and protect her child in impossible circumstances. Urbikas’ own experience as a mother herself added additional insight and depth to the stories of Janina’s saga. In the 1980s, as resistance against communism steadily grew in Poland, so did the unrest as violent strikes erupted, the hardline communists in charge instituted a harsh martial law, and the Solidarity movement took root. Urbikas felt compelled to “educate” people within the context of her family’s story and the mostly unknown Soviet invasion of Poland at the start of WWII. As a result, she began writing Janina’s story. Ironically, as she reached completion in 1998, her mother also passed away. Then, the combined stresses of a family health crisis, an aging parent, a busy life, and the needs of a young family kept the book on hold for several years. In 2007 she enrolled in the Certificate Writing Program through the University of Chicago. They convinced her that telling Janina’s story needed to be her own memoir as well. She began rewriting the entire manuscript to include the history of the time through Janina’s eyes, and incorporated her own life and legacy as Janina’s daughter. Mira, Donna, and Janina circa 1955. Photo courtesy of the author. 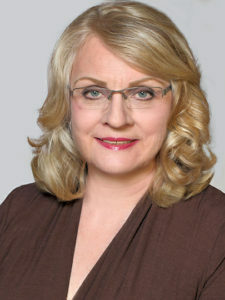 Donna (nee Danuta) Urbikas was born after the war in Coventry, England, and immigrated with Janina, Janina’s second husband and Urbikas’ father, and Mira, who was 15 years older, to the United States at a young age. She grew up with a mother who would not stop talking about what happened to her during the war, a dynamic few of her friends could relate to. Throughout Urbikas’ youth, she was schooled in the Polish culture and language, even though her mother and sister never returned to Poland. Today, Urbikas speaks fluent Polish, and recently presented at a formal conference in Warsaw, Poland. 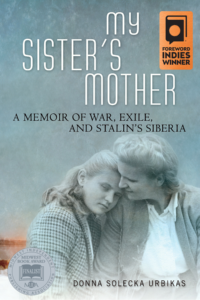 My Sister’s Mother: A Memoir of War, Exile, and Stalin’s Siberia was published in 2016 and has garnered multiple awards. The book has received a warm reception within the Polish community, especially in the Midwest where she calls Chicago home. For more information, including awards and praise, visit danutaurbikas.com. This entry was posted in Author Profiles, Polish History, World War II - Europe by Katrina Shawver. Bookmark the permalink.